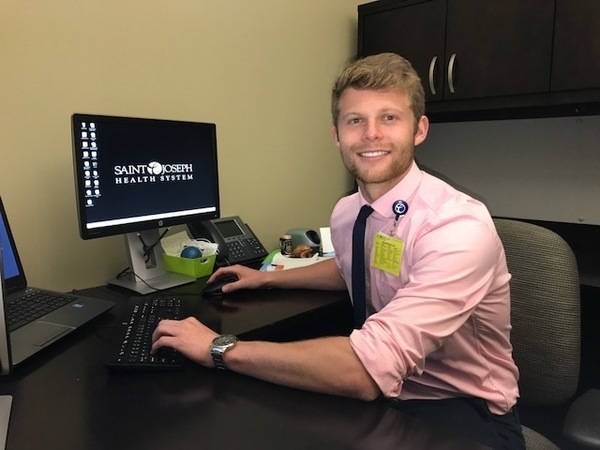 Chris Knaub ’17 MS, a recent graduate of the Eck Institute for Global Health’s Master of Science in Global Health program is spending a year as a Global Health Research Associate (GHRA) with Saint Joseph Health System (SJHS). The one-year position is developed through a partnership between University of Notre Dame Eck Institute for Global Health and Saint Joseph Health System. Knaub will work closely with both partners to provide technical assistance for research, program evaluation, and program development and implementation related to population health. Through this work, the partners will become more informed about the health of the at-risk St. Joseph County, IN, population as a product of many health determinants, including but not limited to medical care. Some of Knaub’s priorities will be managing projects surrounding diabetes and social determinates of health in the community. Knaub is excited about applying what he learned in the classroom to real-life health challenges found in St. Joseph County. Knaub stated, “The master’s program has definitely provided me with the skills necessary to analyze the data that I have already encountered and I look forward to testing what I have learned as new projects appear.” For his Capstone Research Project while in the master’s program, Knaub looked at the drug repurposing of Ivermectin and Mitefosine to combat Chagas disease in Belize. Through his research he also gained information regarding the knowledge, attitudes, and practices of Chagas disease in rural villages in Belize to help with implementation of new vector control strategies. Knaub looks forward to his year working with SJHS and hopes to make a sustainable impact on the health of those living within the community. Watch for Knaub this fall as his Capstone Research Project will be the topic in one of Notre Dame’s famous “What Would You Fight For” NBC features. The Eck Institute for Global Health is a university-wide enterprise that recognizes health as a fundamental human right and endeavors to promote research, training, and service to advance health standards for all people, especially people in low and middle-income countries, who are disproportionately impacted by preventable diseases. The Master of Science in Global Health program provides an engaging science-centric training in the context of global health. The program is a one-year, intensive training that includes two semesters of coursework and one (summer) semester of a field practicum, with a major Capstone Project. Saint Joseph Health System (SJHS) is a not-for-profit healthcare system located in North Central Indiana that offers acute-based hospital care and post-acute services including: community wellness, physical rehabilitation, home care, physician clinics, outpatient services, independent and assisted senior living, memory care and affordable senior apartments. SJHS includes: Mishawaka Medical Center; Plymouth Medical Center; Rehabilitation Institute; Outpatient services of the Elm Road Medical Campus; Health Insurance Services; Saint Joseph Physician Network; VNA Home Care; the Senior Living Communities at St. Paul’s, Holy Cross and Trinity Tower; and Saint Joseph PACE. SJHS serves more than 200,000 members of the Michiana community annually. SJHS is a Regional Health Ministry of Trinity Health in Livonia, Michigan. Originally published by Katherine Ginsbach at globalhealth.nd.edu on September 25, 2017.